As government mandates continue to drive more health care facilities to fully implement electronic records, opportunities in EHR management abound. According to a 2012 report from WANTED Analytics, EHR management is the most sought-after skill for health care employers, with more than 15,000 online job ads seeking these professionals, a 31% increase from 2011. With numbers such as these, many HIM professionals would be foolish not to explore their options in this ever-expanding specialty. Canada also is experiencing a significant shortage of professionals with EHR management skills. And like the United States, it’s undergoing a major transition as health care facilities make the move from paper to electronic records. The Canadian Health Information Management Association (CHIMA) released a workforce transformation strategy report containing information on preparing and educating HIM professionals as new roles become available during the transformation. The CHIMA hopes to educate members on the importance of the evolving and expanding role of certified HIM professionals. AHIMA has created a series of EHR training modules that feature not only lectures on the practice of managing EHR implementation but also provide actual hands-on experience. The virtual lab includes coding and statistical application programs as well as EHR capabilities. Crook says there’s a need to be innovative as more training modules, workshops, and programs are created to fill the need for educating professionals. “Whether it’s weekend courses or online programs, these training opportunities need to take into account the fact that the students are already employed,” she says. 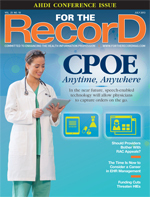 There’s no question that EHR management opportunities are plentiful. At Alberta Health Services in Canada, where the transition to an EHR is under way, new HIM career opportunities are emerging, including content compliance, information management, business analysis, quality management, education, and training. “HIM professionals must continue to evolve our skill sets to meet the challenges of the hybrid and electronic health record,” says Karanne Miller Lambton, CHIM, CPHIT, CPEHR, executive director of provincial operations, standards, and strategies. At Alberta Health Services, the requirements of new EHR roles are broad, ranging from developing the subject matter expertise required to provide advisory guidance on standards to creating taxonomy for electronic content management or defining the organizational legal record of care. For many, it involves a lot of new skill sets.